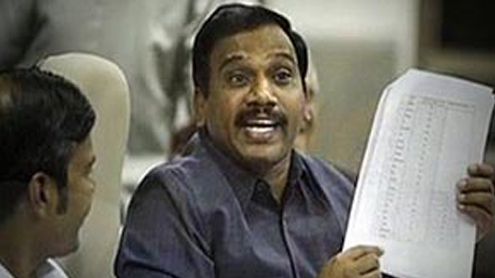 New Delhi: The crucial report on the 2G spectrum scam submitted today names former telecom minister A Raja, who has been accused of several procedural wrongdoings. The report also names Raja’s aides such as R K Chandolia and Sidharth Behuria. “Some officials have been named and some procedures have been commented upon… What the future course of action should be for the grant of spectrum has been commented upon,” Sibal said after receiving the report. The 1500 page report which also suggests measures for the telecom ministry to follow in the future has not been made public. In November, DMK leader A Raja was forced to resign as Telecom Minister after a report by the government’s auditor declared that he had undersold frequency to benefit companies who were ineligible for mobile licenses. The resultant losses, according to the report of the Comptroller and Auditor General (CAG) could add upto Rs. 1.76 lakh crore. While Justice Patil did not go into the criminal culpability of the case, he did look into telecom policies dating back to 2001. So the report is also expected to state whether there were instances of any wrongdoing in the NDA years. The CBI is investigating criminal conspiracy and other aspects of the telecom scam, but they have only registered a preliminary enquiry report till now.